It’s a low compression, high headroom overdrive with high output. Premium quality classic blues/rock pedal that works very well with complex overdriven amp sound. This pedal is now offered as lower-priced pcb-model or hand-wired pedal. Both share the same specs and tone. It’s a low compression, high headroom overdrive with high output, and it has a Body knob for adjusting low-mid content and treble. The LGW was made to be a stackable overdrive that could go anywhere in the pedal chain and the compression normally associated with this type of circuit is reduced same as several distortion mechanisms. This pedal will work very well with amps and other pedals that have a lot of complexity or compression, a situation that not all pedals work well. LGW makes a great building block to sound yet it works standalone and especially with humbuckers where normally this type of circuit would not work satisfactory, much due to bass loss and sometimes separated sounds (where transients feed through and a cloud of distortion follows beneath. Body control gives access to medium midhump at the center position and allows treble boost at CW rotation and low mid/treble boost a CCW position and so unit also can provide distortion albeit a smooth type. LGW can be used as an overdrive to already distorting amplifiers or pedals downstream, as well as function as a filter when feeding with fuzz pedals that may be rough on some amplifiers and can also be used as a light overdrive for just breaking up sounds. 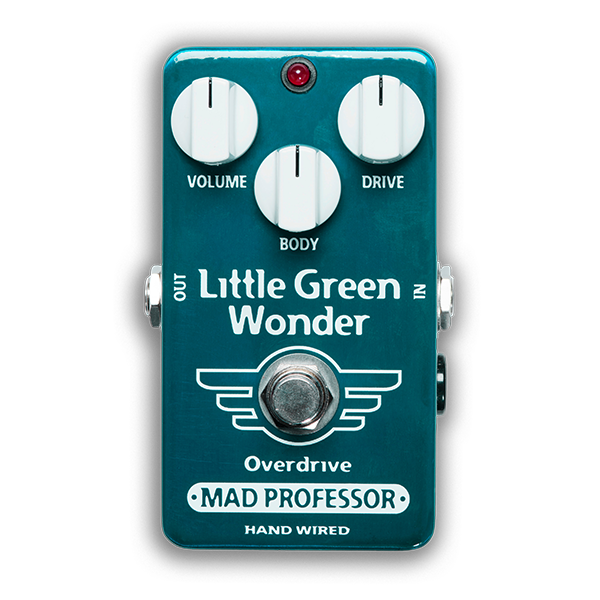 Whereas Little Green Wonder is a TS-style pedal, but one for those who don’t generally like TS-style pedals. Big difference between these two pedals would be headroom, distortion style and distortion depth and treble response, output level, the function of the tone knob, color, symbol…. they do share a common layout of mechanical components.